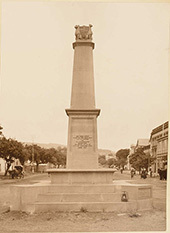 The Grahamstown Centenary Memorial was unveiled on 14 August 1912 by the Honourable Jan Christian Smuts, then Minister of Finance in the Union Government. The City of Grahamstown was proclaimed in August 1812 and named Graham's Town after Lieutenant Colonel John Graham, a British officer. Captain Andries Stockenstrom was also present when the site was chosen. The tree under which the men took the decision was apparently a mimosa tree (Acacia) which fell in 1842. 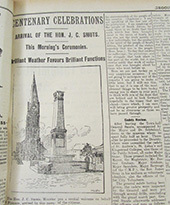 The memorial was paid for by public subscription. BATTLE OF GRAHAMSTOWN, APRIL 22 1819. The memorial was possibly designed by Prof FW Armstrong - the first Professor of Art at the Rhodes University College. Armstrong's signature appears on a perspective drawing published in the Grocott's Mail of 14 August 1912. The monumental mason responsible for the construction of the sandstone memorial was GEO. GIBSON of Queenstown. His details were inscribed into the sandstone at the lower right hand side of the main panel on the east face of the memorial. The memorial has recently (2018) been defaced with red spray paint - probably by supporters of the EFF party. Source: Basic text provided by Fleur Way-Jones of the Albany Museum, expanded and extended by William MARTINSON. The inscription at the base of the statue reads 'Fecit Aug. Falise Hollande 1915'. Which is Latin for 'Made by August Falise Netherlands 1915'. See Wikipedia.